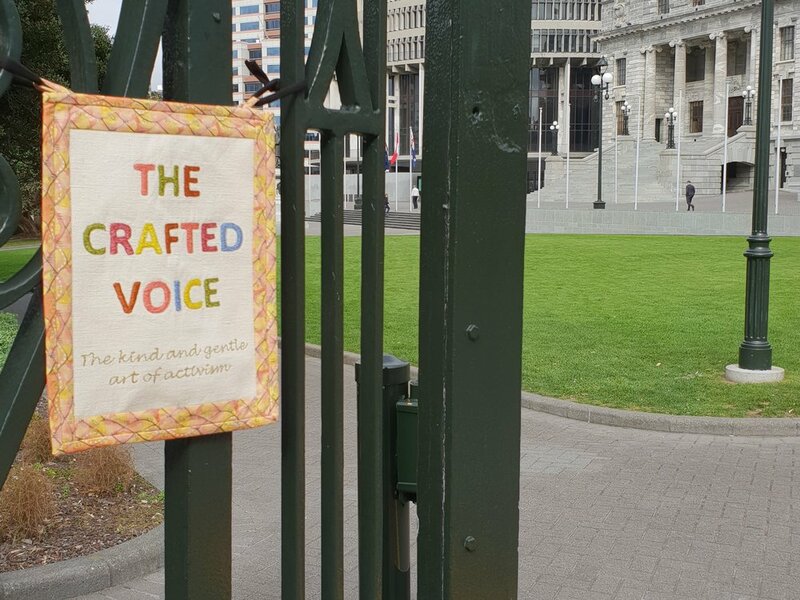 “Crafted Voice” is an invitation to come into a public space where you can craft your voice into a handmade object. Embroider it with words or not. Then use it to influence, connect with or persuade those who implement change – gently. Recently I rediscovered Sarah Corbett and 'How to be a'Craftivist, the art of gentle protest'. Corbett is part of an activist family and went to her first protest march as toddler. As an adultshe worked for N.G.O.s. but she found the constant battle and fight exhausting, and one day on a train journey, she stitched cross stitch instead of working and arrived at her destination relaxed and refreshed. She understood how doing craft refreshed her soul. She then thought "What if I use this in a different way and instead of fighting for change I got along side people, tried to understand them regardless of their political persuasion and worked with them". She and a group of fellow stitchers made “Don’t Blow it Handkerchiefs” for the board of Marks and Spencer’s. The statements on the handkerchiefs thanked the board for what they were doing and the responsibility they held but said “don‘t blow it - remember the living wage”. The board were so touched by their beautifully made and presented gifts they asked to see these crafters. And after a number of meetings over ten months Marks and Spencer’s made a public statement saying they would pay every one employed by them the living wage. We are concerned both for the difficulties teachers are experiencing due to lack of funding and resources, and the plight of midwives, many of whom are leaving their profession. The midwives pay situation is dire, and some are even pumping petrol to make ends meet. Rosie White of the Crafted Voice is sitching clouds for Treachers and hearts for midwives and would love you to join in.